They discovered that the world wasn’t flat, AND they brought us haloumi. We owe a lot to the Greeks, so we’ve decided to get our Greek geek on and bring you the best of the best in Brisbane! Wear your stretchy pants friends, you’re going to EAT. Perch yourself by Hellenika’s poolside bar and Nick’s your uncle. The Calile Hotel’s signature restaurant happens to be one of Brisbane’s best Greek eateries, with all the zucchini chips, veal dolmades and grilled octopus you can physically handle (which is more than is humanly possible if you’re actually Greek, thanks for the stomach training, yia yia). While you’re at it, get your hands on a six one three cocktail and drink in strong beachy vibes under palm trees and sunny skies. All that glitters is Greek. Greca rests by the river at Howard Smith Wharves, but the trusty kitchen team are always hard at work to add the fine to your Greek dining experience. Start with saganaki cheese with honey and oregano before working your way up to grilled pork chop with pistachio and rosemary butter. Better believe you’re ending the night on a sweet note with the most authentic tasting katoumari (smashed filo, walnuts, semolina cream)! You won’t be starving at Stavros. This handsome little Kenmore number had us at house dips, and continues to sweep us off our feet with the likes of sustainable market fish, Mooloolaba split king prawns and crumbly almond baklava cooked to perfection. In between authentic eats and Stavros’s interior adorned in white and blue, you’ll be feeling closer to the motherland than ever. If you haven’t dug into an oversized feta stuffed mushroom or wrapped your mouth around a lamb yiros from Little Greek Taverna have you even eaten out in Brisbane? Known for its authentic flavours, generous portions and cheeky wait staff, Little Greek Taverna is a West End treasure. Add BYO wine and beer and you’ve got yourself a night to remember. The Brisbane epitome of food, culture and dancing, many a night has been made at Nostimo at The Greek Club. 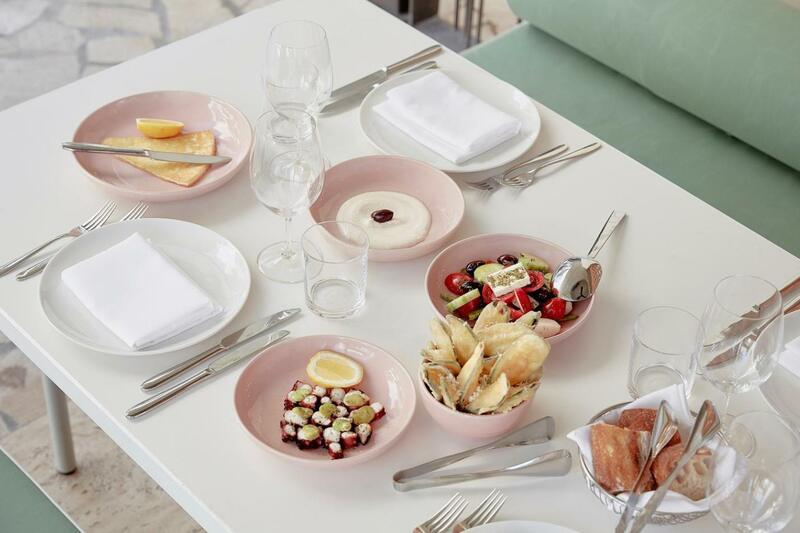 For a plate-smashing good time, stop by and indulge in a banquet of pita and dips, pork belly baklava, fried calamari with ouzo mayo and lamb skaras over sweeping South Brisbane views from the balcony. Skanikopi-that! If you go to Lefkas, you’re going to have some problems with the food. Not because plates of grilled haloumi, stuffed roasted capsicum and moussaka aren’t delicious. It’s definitely not because perfectly cooked lemon potatoes, green mussels and chicken souvlaki are covering your table. It’s because with food this good, and with this many options – it’s inevitable that you’ll eat yourself into a mild coma. It’s also BYO Tuesday – Thursday, which means you won’t feel guilty ordering that second plate of grilled feta (not that you ever should). More about Greek on the go? Ride your chariot straight to Zeus Street Greek, known for their authentic pitas, tender meats and mouth-watering Spartan boxes with Aegean slaw, tzatziki and pilaf. We can’t look past the Classic Tzimmy lamb wrap with succulent, souvla cooked lamb, fresh salads and perfectly cooked chips. When you crave succulent, oven-roasted lamb or scrumptiously fresh marinated octopus, head to this family-owned taverna. Potentially a contender for ‘cutest walls ever’, the hand-painted murals of Santorini provide the perfect backdrop for a romantic dinner for two (or twenty); these guys are all about the extended family. So pour yourself an ouzo and say yassas to Brisbane’s best Greek!